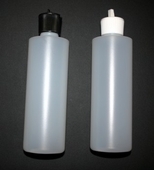 We carry 2oz, 4oz, and 8oz opaque plastic bottles with the flip top cap or pumps. As you can see in the picture, the bottles have a slight white color to them, but you can still see through the bottle and see your product. We also carry a variety of jars with lids or pumps. 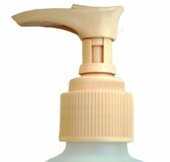 You can choose a plastic bottle in the 2oz, 4oz, or 8oz size with the flip top or add a pump to the bottle. Both the flip top and pump will disperse oil or lotion or any other liquid product. We also have High Volume Pumps that work better with lotions or thicker mediums, and the Locking Up Pump that works great with oils or thinner mediums. Don't forget to check out the glass bottles which are great for essential oils!